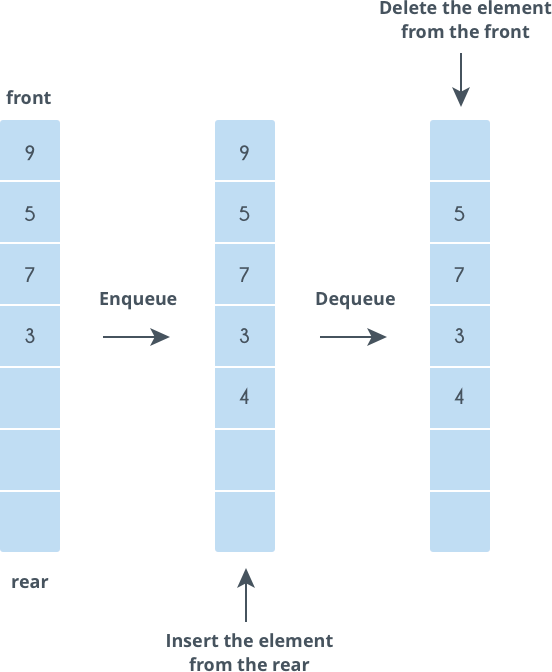 Queues are data structures that follow the First In First Out (FIFO) i.e. the first element that is added to the queue is the first one to be removed. If the queue is not full, this function adds an element to the back of the queue, else it prints “OverFlow”. If the queue is not empty, this function removes the element from the front of the queue, else it prints “UnderFlow”. 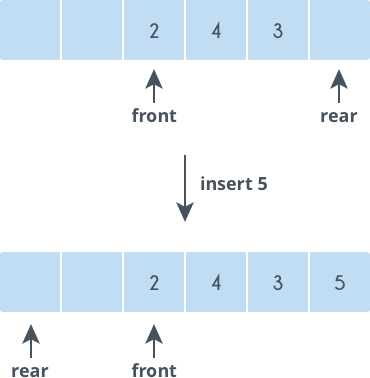 This function returns the front element of the queue. This function returns the size of a queue or the number of elements in a queue. If a queue is empty, this function returns 'true', else it returns 'false'. Let us try a problem. You are given a string. Take the first character of the string and put it at the end of the string. Find out what the string will be after $$N$$ steps. The string can be considered as a queue. At each step, dequeue the character from the front and enqueue it at the end. Repeat this process $$N$$ times. Let us code this problem. In a standard queue, a character is inserted at the back and deleted in the front. However, in a double-ended queue, characters can be inserted and deleted from both the front and back of the queue. Size and IsEmpty are implemented in the same way as in a standard queue. A circular queue is an improvement over the standard queue structure. In a standard queue, when an element is deleted, the vacant space is not reutilized. However, in a circular queue, vacant spaces are reutilized. While inserting elements, when you reach the end of an array and you need to insert another element, you must insert that element at the beginning (given that the first element has been deleted and the space is vacant). Circular queues support all the functions that are supported by standard queues, however, there is a difference in the implementation of these functions.